Say hello to your stereotypical trying-to-be-healthy Monday recipe. Like the many Mondays that have come before, I attempt to lure you in with the promise of half-assed vegetables and a balanced meal. Only to finish you off with a bowl full of butter and a glass of tequila on Friday. I guess it doesn’t have to be Monday… but it is. And the truth is that even though I like quinoa, one of my main goals in life is seeing how many unhealthy things that I love can be stuffed inside the same bowl so I can dub the entire thing health food. Bacon grease, cheese and brown butter breadcrumbs? Instantly because healthy with the added quarter cup of quinoa. Yessss. And I want to tell you that this is another one of my cop-out Thai recipes because it sort of is, but I just love that sauce soooooo much. 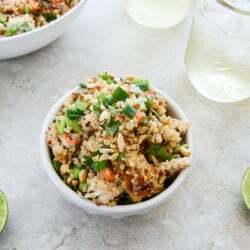 It first appeared on my thai chicken wings and then later on this thai crunch chicken salad, and it’s not a stretch to say I whip it up nearly once a week just to see what else I can thai-afy. Thai nachos? Check. Thai burgers? Check. Thai noodles? Check. Thai sauce on a spoon? Check. Don’t worry. Thai cookies are not next. You may have thought otherwise with how much I talk about this. I know. I’ll just shut up. So many veggies for me! Damn you keep making these tasty dishes. Like the way, you write content on top notch. Visit foxesera.com, your one stop destination for finding the best reviews on all home & kitchen appliances along with comparisons, price list, and buyer’s guide. The dish is looking so amazing!! I will definitely be going to try this today. Thanks and keep posting recipes. Lovely Dish!! Tried this dish yesterday…..It was really yummyy! !